I’ve been riding two-wheeled motorized vehicles for most of my life. As kids, we stood milk crates on end, fit wheels on the bottom connected up to lawn mower engines braced inside, and putted around local country lanes until the contraptions fell apart. When my wife and I first married we couldn’t afford to keep two cars, so we bought a used, street-legal Suzuki 185cc dirt bike. When one of us needed the car, the other took the bike. Cheap, reliable, economical transportation. Years later, perhaps experiencing a second childhood, I purchased an older, gently used Honda CB500. After riding that more powerful machine for a couple of years though, I realized two things. First of all, I’d never learned to ride a motorcycle slowly. The object of the exercise seemed to be to run up through the gears as quickly as I could in order to go as fast as I could until I had to stop, then start the process all over again. Secondly, as I approached 50 years of age, my reflexes weren’t keeping up with my right wrist. (For those of you who don’t understand that reference, a motorcyclists’ right wrist is the one that twists the throttle.) A dangerous combination. So, just as I’d given away the Suzuki to the son of a friend years before after we’d purchased our second car, I gave the Honda away to a neighbor boy after I realized that I wasn’t suicidal. In the spring of 2008, when the price of gasoline approached $4.00 a gallon, my third childhood kicked in. I went looking for a motorcycle. I found a motor scooter…to be exact, a Chinese-manufactured 150cc machine manufactured in the Shanghai JMStar factory with the model name Zeus. (The more clear-eyed of you will note the word Alpha on the side of my scoot. The factory called it a Zeus, the importer labeled it an Alpha. Who knows what causes humans to name their machines as they do?) It was light, cute, and peppy. It was cheap - $1,500. It would reach 55 miles per hour with relative ease. It would get 70 miles per gallon or more. 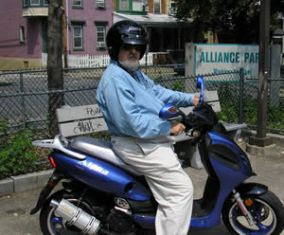 My scooter became my chief form of transportation as well as my passionate hobby. Who knew? And who knew that there were scores of us in the Lehigh Valley, tens of thousands of us in the USofA, perhaps millions of folks throughout the English-speaking world who were similarly afflicted? We meet on the internet. We talk about our scooters, our jobs, our families, our lives. We trade jokes and funny videos. We become cyberfriends who are as real to each other as our old school chums, more real because we are brought together by common interest rather than by accident of proximity. More about scoots in general and my scoot in particular in Part II.